TheGrill is pleased to announce new speakers and topics for this year’s conference on October 2 and 3. Lionsgate Television President Sandra Stern, Megan Colligan, Paramount Pictures president of worldwide distribution and marketing, and Mitu President and founding partner Beatriz Acevedo join the stage at TheWrap’s eighth annual media leadership conference. The three executives join other business thought leaders and innovators including Jason Hirschhorn of Media REDEF, Rich Greenfield of BTIG Research, Chris Williams of pocket.watch, Dave Shull of The Weather Channel, and Thai Randolph of Kevin Hart’s Laugh Out Loud who will debate the future of entertainment and technology at Montage Beverly Hills on October 2-3, 2017. New topics added to TheGrill include: The Diversity Challenge — Hollywood and Silicon Valley face a clamor of criticism over entrenched sexism and lack of diversity in casting and the executive suite. With rising awareness in support of inclusivity, many believe that it is still not evolving fast enough. TheGrill brings together influential voices and people on the front lines of this challenge to discuss solutions. The conference will also cover: The Revolution in Entertainment Marketing — The tried and true formulas are no longer reliable, but do you really want your whole opening weekend campaign on Twitter? The marketing of entertainment is about cutting through the media cacophony. Hear from the smartest minds in the industry about how to do that, and where change is happening. Also previously announced are new product demonstrations by ZoneTV and VR studio Cubic Motion. TheGrill 2017 returns with two full days packed with hard-hitting conversations, high level networking and industry icons discussing the edge of content and tech. 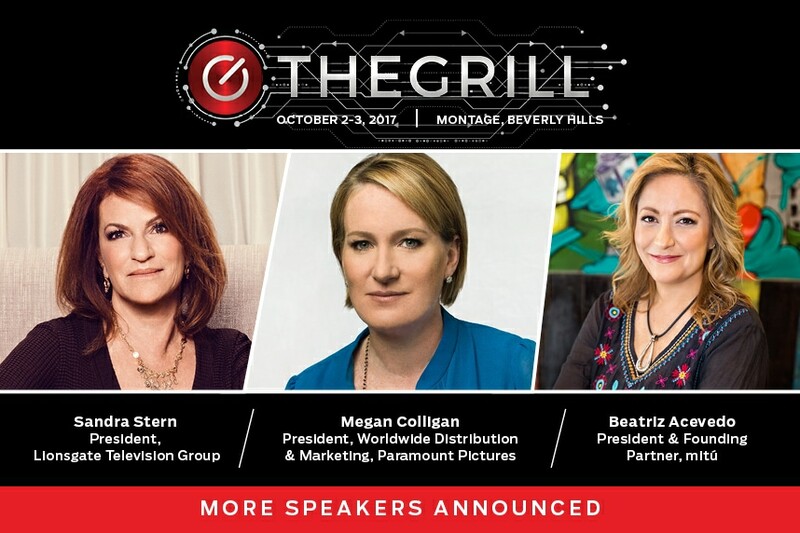 Now in its eighth year, TheGrill leads the conversation on convergence between entertainment, media and technology, bringing together newsmakers to debate the challenges and opportunities facing content in the digital age. How to build a next stage media company No silos, no walls! Hear from the people who are successfully leading the way forward and leaving traditional systems for producing and distributing content behind. What makes for good VR experiences? The logistics are complicated, the cost is high and the audience is still small. TheGrill welcomes the best minds in the biz as they grapple with whether VR and AR represent the next big thing. Is there trouble in China? - Three panels take on Chinese deal financing, the streaming boom and digital fast forward. Returning this year — The Silicon Beach Roundtable brings leading digital media entrepreneurs, financiers and big media executives for an exchange of ideas and find solutions to shared problems. New this year — The Independent Producers Roundtable brings together leading producers to tackle the challenges facing independent producers across the spectrum of content platforms and formats. ThGrill offers you access to two full days of panels and networking conversations and also includes the opening night cocktail party, keynote panels, a working lunch and closing night Innovators List Celebration. Buy your ticket today before prices increase on August 31. Diverse programming anchored by versatile talent and supported by big brands has always been the hallmark of Hollywood. As technology brings new models to the fore — in production, distribution, display and monetization — TheGrill is a platform for the leaders, the deciders and the disrupters to explore this reconfigured landscape as it continues to transforms around us.